This Bali adventure cruise takes you from the mainland to Lembongan, a small island about an hour away. Here, you'll be transferred to Mushroom Bay, a peaceful cove with blue water and white sand, where you can go snorkelling, floating peacefully over the vivid coral reefs. You can also choose to admire the coral from a semi-submersible coral viewer, go kayaking in the sea, or ride on a banana boat! At lunch time, you'll head into an exclusive beach club, where an elaborate buffet is served, with fresh grilled seafood, salads, vegetarian delights, and lots more. There is also a well-furnished children's club with caring professionals to keep the kids busy. By late afternoon, you'll board your boat and head back. 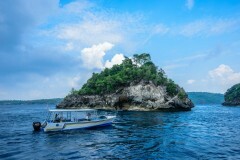 You'll be taken to Mushroom Bay, one of the most famous beaches of Lembongan, and this is where you'll spend the day. From here, you'll go snorkelling, try out kayaking, and go on unlimited banana boat rides. You can also view the spectacular coral reefs from the semi-submersible coral viewer. 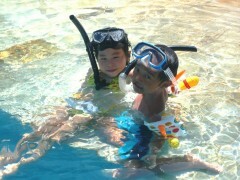 • Go snorkelling in the blue waters of Bali and explore gorgeous coral reefs and colourful fish. 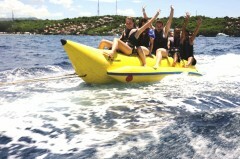 • Try kayaking and unlimited banana boat rides, or participate in fun beach games. • Take in the underwater views from the semi submersive coral viewer. • Eat a delicious beachside BBQ meal at Mushroom Bay. • Take in stunning views of the eastern islands of Bali on your way back. Locker facilities are included in this package. You will be responsible for your own belongings. 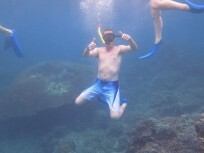 The operator will not be responsible for any loss or damage during the Bali snorkelling cruise. The operator will provide the equipment needed for snorkelling and other activities, but you will be responsible for any damage. Do use it with care. Participants are strictly prohibited from carrying weapons, guns, illegal drugs and psychotropic substances, alcoholic beverages and/or other hazardous substances, explosives and specific fruits such as durian on the Bali snorkelling cruise. 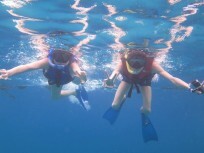 You will not be allowed to participate in the snorkelling activity if the instructor believes you to be ill or under the influence of drugs or alcohol. If cancellation is made 2 days or more before the departure of the Bali snorkelling cruise: Full refund, minus any transaction charges. If cancellation is made between 0-1 days before the departure of the Bali snorkelling cruise: No refund. The operator takes utmost care of the participants and has the right to cancel, change or reschedule the itinerary of the snorkelling in Bali if it appears harmful to the participants or staff. The operator is not responsible for any injury, accident or death during the Bali adventure cruise or sea transfers. Children under 4 years will be free. Children from 4-14 years will be charged INR 4500. Pick-up schedule for the snorkelling cruise in Bali: Nusa Dua (06:45-07:00 hrs), Tanjung Benoa (07:00-07:15 hrs), Jimbaran/Kuta/Seminyak (7:15-7:30 hrs), Sanur (07:30-07:45 hrs). Eat a filling breakfast before the pick-up vehicle arrives at your hotel by about 07:00 hrs. You'll be driven to Benoa Harbor, where you'll board a catamaran cruise boat that heads out to Nusa Lembongan. Once you reach the island, you'll be transferred to Mushroom Bay, and this is where the fun begins! There's lots to do here and you can snorkel in the clear waters, go for a swim or enjoy unlimited banana boat rides. Take a short tour of the island, enjoy beach games and if you'd prefer staying onboard, you can view the spectacular marine life from the semi submersible coral viewer. In the afternoon, you'll enjoy an appetizing BBQ lunch of freshly grilled fish and salads, and you can also buy your own cocktails at the beachside cabana bar. 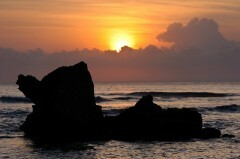 After this, you'll head back to Benoa Harbor and be dropped back to your hotel by 17:00 hrs. Your trip ends here. Personal expenses such as extra meals, packaged water, soft drinks, telephone calls, tips, etc. You'll be picked up and driven to Benoa Harbor. Once aboard, you'll be served tea and snacks while you head out to Nusa Lembongan. Today's package includes an appetizing BBQ lunch with salads, grilled fresh fish and whole lot of other delicious items all arranged at a pool-side cabana in Mushroom Bay. In the evening as you head back to the mainland, you'll be served evening tea and snacks. At Benoa Harbour, you'll transfer to vehicles that will drop you off at your hotel. 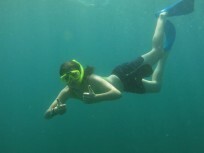 You'll be picked up from your hotel for this Bali snorkelling trip. Please check the pick-up schedule for hotel transfers from the Additional Policies section. 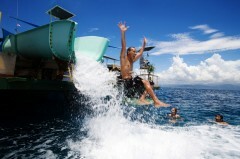 The operator will arrange your transport to the start point of the Bali snorkelling cruise.